Ah, the rush to publish…Della has beaten me hands down on this one – I blame a nasty episode of Meniere’s: Foxbaits laid on our intended route, we ventured instead into the Baw Baw Nat Park (of course not telling the dogs; they were doing anything wrong – you wouldn’t want to fill them with guilt; they were enjoying themselves too much). I used to hunt over that whole area with hounds before it was declared a nat park (in 1983?) and indeed until we were ourselves hunted out of there by police in helicopters one Queen’s Birthday weekend in the mid 80’s! Della was there then too. There is still a hunter’s hut no more than a km from the Mushroom rocks (NOT the scout hut!) where once I warmed Della’s frozen feet on a snowy morn about five years ago. This is sometimes called the .NBW Hut’. I have been wanting to take Della on the full Warburton to Walhalla walk (four days (?) – and GREAT in hot weather because temp drops by @1C per 100 metres elevation). I think I may persuade her now. 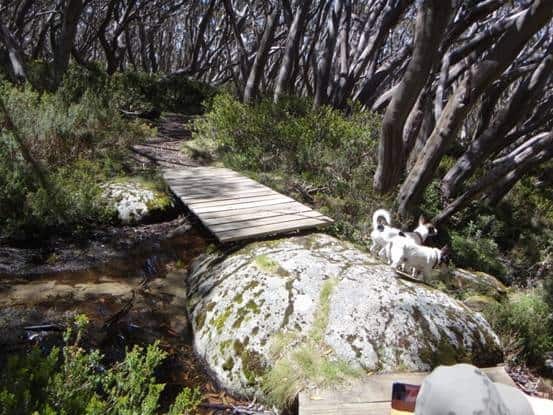 We walked past the Mushroom Rocks, climbed Mt Erica and went on to the ruins of the Talbot Hut and the extraordinary stream nearby right on the top of the mountain. There are many such streams right across the Baw Baw plateau so that water is never a problem. Beautiful clear, & icy-cold too. 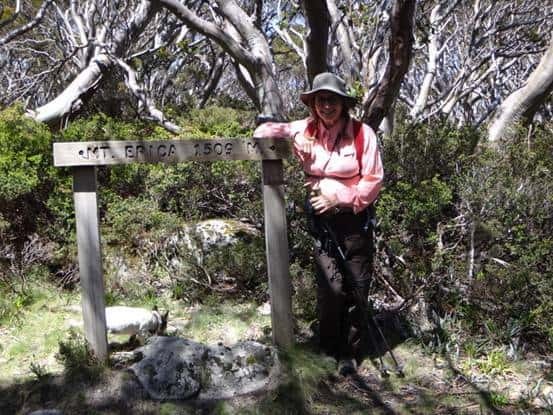 The plateau is well-named as there are @ two days of quite flat walking from Mt Erica on until you begin your descent after Mt Whitelaw amid beautiful snow gums and other interesting alpine veg such as prostrate conifers and many mountain flowers.